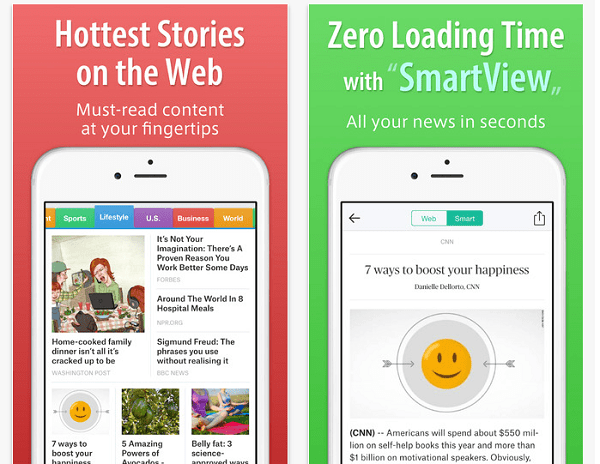 SmartNews is a news aggregator that gathers the most popular news from a variety of sources. Developed by Smart News Inc. the app has been downloaded more than 5 million times, and much of that is due to the way it delivers the news, quickly and efficiently. The best thing about SmartNews is it’s interface, which is clean, clear and intuitive. News is loaded in an ad free window and links at the top of each page keeps news items categorized neatly. Navigation is just as easy as you just swipe right or left to go through the various news sections. That might not seem like much, but it actually reduces the amount of taps you do, and scrolling down is very smooth. SmartNews also scores points for being very clean and while the categories that divide the news are colorful, the overall scheme is friendly to the eyes. Combine the friendly colors with the very readable font, and you got a well-designed news aggregator for mobile. If you love to read news but don’t have the time to go to various news sites, then you will find this app useful and downright practical. Rather than spending hours adding sources or channels, SmartNews does it for you. To make sure that you’re always updated, SmartNews offers news from a variety of sources like USA Today, NBC, TIME, AP, Reuters, Perez Hilton, Tech Crunch and more. SmartNews is also updated on a continuous basis so bugs are fixed quickly, and the app is very stable even used extensively.